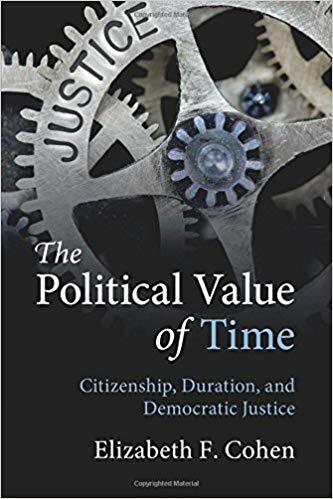 I ran across a reference to Elizabeth Cohen’s The Political Value of Time online somewhere and was interested because I’ve been working with Leonard Nakamura on time use as an alternative economic welfare measure. It’s really a very interesting book, though a bit dry and somewhat repetitive. The key point is that “time is a valuable good that is frequently used to transact over power.” States have temporal as well as geographic borders. States have the power to command citizens’ time – through age limits for voting, or prison sentences or curfews. Time is also one of the constituents of democratic order through processes such as the length of election campaigns or the age of majority: process is what makes durational time political. “Time works elegantly as a means to translate intangibles like loyalty and civic virtue into precisely measured political terms.” Indeed, time has a useful dual function of appearing to be objective and at the same time able to be situate in a specific social context and political order. The book considers the critique that attempting to make different values commensurable is inherently reductive: “temporal commensuration in particular is able to wring procedural solutions from contradictory points of view.” Cohen refers to Cass Sunstein’s idea of Incompletely Theorized Agreements (ITAs), which allow people to agree on the specifics of a decision without agreeing on the principles – such as agreeing sentencing guidelines without agreeing whether the aim of punishment is retribution or rehabilitation. Many – most? – political systems are built on contradictions. Processes inscribed in time are one means of reaching decisions. Although value pluralism, be it Aristotle or Elizabeth Anderson or Amartya Sen – is intuitively appealing, states do take decisions and there is always an implicit reduction to one dimension. This is an issue that’s becoming pressing as AI algorithms start to take government decisions – they’re uber-utilitarians who decide super-fast. Cohen argues in this book that using time as the common measure is less reductive than money. It’s a very interesting approach.